B efore I get into my thoughts of Tinker, Tailor, Soldier, Spy. If you are not familiar with John le Carré’s work let’s cover some groundwork early on - despite what the marketing for Tinker, Tailor, Soldier, Spy would have you believe - George Smiley codename Beggar-man (an indication of his character status) the lead played by Gary Oldman is not a super star spy. He is an experienced spy but has become a bureaucratic worker, more of a long suffering office worker who has had it rough having lost his job as well as his wife. He is more of a hard pressed upon tragic everyman filling his life with routine. Update: I have seen Tinker, Tailor, Soldier, Spy again and my thoughts after a second viewing are here! Like a Cask strength whiskey, leather soled shoes; an Armani jacket there is something reassuring about the quality of John le Carré’s works. Sure the aforementioned list are just objects but there is something about them that just feels quality and makes you feel good about possessing them. I guess I associate le Carré and high quality because of my Father. My dad is a huge fan of John le Carré’s works and even though he grew up in the shadow of the times featured in le Carré’s books, his affinity never really rubbed off on me. I grew up in the sea and on the beaches of South Africa a world away from the grey and drab spy world of the cold war. Besides James Bond on a wet bike, with a cheeky wink & grin in between shooting villains was a lot cooler (despite Roger Moore’s bell bottoms and nylon suits). If anything I thought I would get around to reading those mature, stuffy books at some point probably when I was older and more stuffy. Well I am older now. And free of preconceptions about Tinker, Tailor, Soldier, Sailor. So when I heard that Tomas Alfredson the man behind Let the right one in and the top tier cast that was to be involved (Gary Oldman, Colin Firth, Tom Hardy, John Hurt, Toby Jones, Mark Strong, Ciarán Hinds) how could I not look forward to Tinker, Tailor, Soldier, Spy? Then the trailer came out - t should be noted I try not to watch trailers anymore if I can help it – they erode my viewing pleasure but I was completely spell bound by the engrossing atmosphere created by the performances, crisp visuals and spine tingling violin stabs. I managed to catch a talk with Screen writer Peter Straughan and Producer Robyn Slovo at Empire’s Big Screen as well as the 3 clips they brought along read more here! Around this time I got concerned. Nothing that I had seen or knew about Tinker, Tailor had, well made it seem it would be anything less than a 5 star and outstanding cinematic achievement. Were my expectations being raised too high? Would that be the downfall of Tinker, Tailor, Soldier, Spy? Lights dim, I take my seat and away we go. As one would glean from the trailer and the talent involved Tinker, Tailor, Soldier, Spy is pure class from beginning to end. Tomas Alfredson immerses us in the shadowy, paranoia steeped grey world of post second world war life at the height of the Cold War. A time when the victorious former allies had divvied up the intellectual and technical remnants of the Nazi war machine and then turned on each other as the race for global dominance heated up. Alfredson creates a dark 70s atmosphere by mostly employing tight muted interior shots and grey exteriors, this adds to the claustrophobia of the time but more effectively he distils the world down to a handful of relationships. Even giving anonymous arch adversaries personality through clever devices, masterfully bringing the story to an emotional and personal level. I’m unsure if this follows le Carré’s story but Alfredson pulls it off on screen. The Circus is headed up by Control (John Hurt) The Chief of Circus and his experienced espionage team; Deputy Chief George Smiley (Gary Oldman), Circus Director Of Operations - Percy Allenine (Toby Jones) and Circus Officers Bill Haydon (Colin Firth), Roy Bland (Ciarán Hinds) and Toby Esterhase (David Dencik). Control has come into some intelligence that implies that there is a traitor within the trusted circle of The Circus. He codenames the suspects Tinker (Percy Allenine), Tailor (Bill Haydon), Soldier (Roy Bland), Poorman (Toby Esterhase) and Beggerman (George Smiley). And sets on a course of action to uncover who the traitor is. Unfortunately his adversary turns out to be more insidious than imagined and things don’t end well for Control. In the fall out poor faithful George Smiley an unwitting accomplice is forced into early retirement. 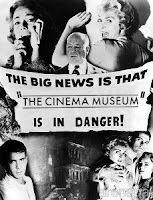 The story then picks up again when an out in the cold George Smiley is called up again and asked to look into the possibility of there being a traitor in the revised Circus, now headed up by Percy Alleline and his deputies Bill Haydon, Roy Bland, and Toby Esterhase. The narrative is told from Smiley’s point of view rather than a third person overview, which may throw some of the audience - as we only see and understand the story as George Smiley sees it unfold, with the help of some flashbacks. Alfredson set about to create a film that was not only set in the 70s but felt like it was made in the period. And the intelligent sensibilities applied to the way the narrative unfolds are testament to this. In short you are going to have to engage your brain to follow the narrative. 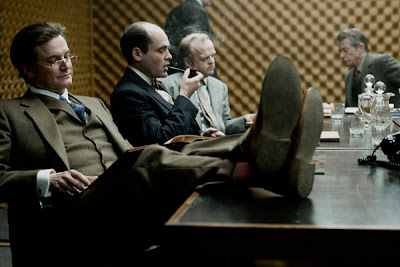 Adopting this technique means that some of the characters are sadly unexplored but Alfredson steers Tinker, Tailor clear of becoming a formulaic procedural spy hunt. Ensuring that Tinker Tailor will stand up to multiple viewings as you go back to work out how it all came together. And although I made some guesses the identity of the mole is always just out of reach. 2 days after watching Tinker, Tailor - I don't feel as if I have praised Tomas Alfredson sufficiently and as Tinker, Tailor continues to slowly settle in my mind. 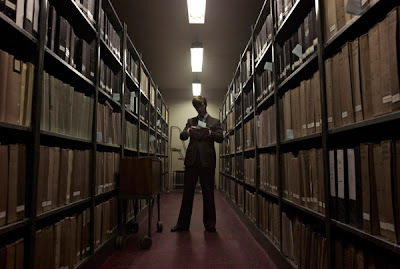 Due to the sensory overload from my first viewing, now only certain bits of the film stick in my mind and I can't wait to see Tinker, Tailor again. Knowing that on second viewing it will almost surely be a different film as I am aware of certain things I'll be able to focus on detail and other elements. Tomas Alfredson should really be praised for taking something that is already an icon of literature and popular culture and creating his own relevant instant classic. With both aesthetic appeal and depth, whilst being bold enough to stay original and not bending to mainstream sensibilities. 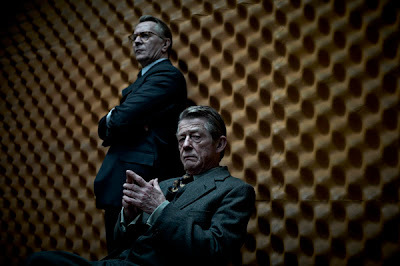 With Tinker, Tailor Alfredson his camera work is outstanding as he creates a visual and auditory experience echoing the claustrophobic cold period the film is set in and it is easy to see why he is the right man to turn Tinker, Tailor into a film. He also makes rich and effective use of symbolism to reinforce feelings or themes. 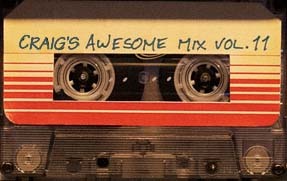 And 2 of these are still very vivid in my mind, days after watching the film. Alfredson balances the visual and auditory elements well with allowing the cast to do what they do best and gives his performers the space to inhabit their characters, which they do. As you would expect from the power house talent involved performances are strong across the board. My heart swelled to see Kathy Burke impress in a serious role, as well as the always brilliant Stephen Graham shine, both in small but pivotal roles. I have seen some shout outs for both Benedict Cumberbatch and Tom Hardy. I’m not familiar with Cumberbatch’s work but he is absolutely outstanding as George Smiley's trusted insider, both vulnerable and like the period clearly there is a lot more happening under his calm veneer. The chemistry of his mentor/student relationship with Gary Oldman's Smiley is emotionally spot on. Be prepared to be surprised by a Colin Firth, as you have never seen him before and Mark Strong’s character almost brought a tear to my eye as we understand his world better. But the real surprise of Tinker, Tailor, Soldier, Spy is Mr Gary Oldman. I think it is generally accepted that he is a living Legend that came up the hard way - on pure talent. And it may be because I have seen him as the reliable sidekick or over the top villain for so long that I have forgotten what a dynamo Gary Oldman is. 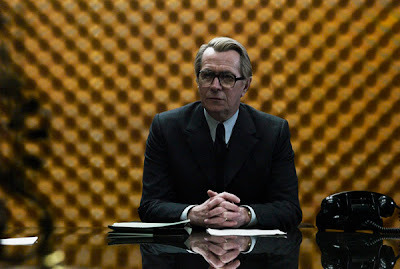 Gary Oldman’s George Smiley is a master class in acting. Not only does Oldman chameleon himself into a forgettable everyman, as required of a spy as he methodically and cunningly goes about uncovering who the mole might be, but he delivers an understated, subtle yet menacing performance. There is a particularly brilliant scene where George Smiley anecdotally recounts a story from his scalp hunting days, when he tried to turn a possible defector. The entire scene is spine tingling not only because of the story but Gary Oldman’s delivery is absolutely electric. This must surely be his greatest performance to date and the one that, dare I say it wins him his first Oscar? Yea, that’s right Mr Gary Oldman one of the entertainment worlds brightest lights has not as yet won an Oscar. I don’t want to give anything away but watching the George Smiley’s character arc is something to behold. The climax is utterly magical and the final sound crescendos to an absolutely astounding ending that must cap the performance of a lifetime. This was the first press screening that I have been to that the audience actually broke out into spontaneous applause. 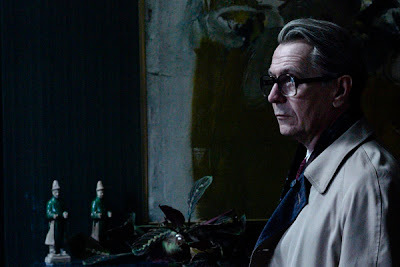 If you are in the mood for an intelligent, intense and riveting spy thriller that’s plays like a dark detective story, as well as witness power house performances, including a performance from Gary Oldman that will no doubt be a pinnacle in his illustrious career Tinker, Tailor, Soldier, Spy is the film for you.